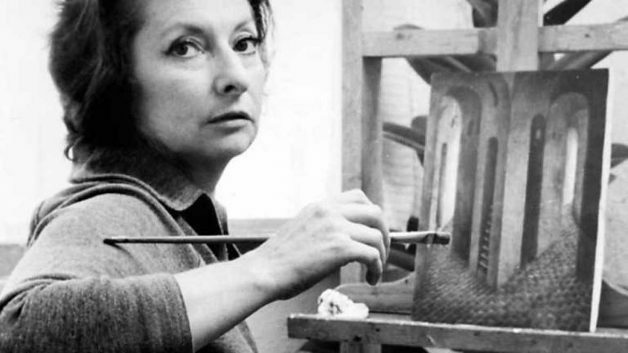 Why This Surrealist’s Paintings Still Inspire Witches and Academics Alike – Zero Equals Two! In Remedios Varo’s fantastical, Surrealist paintings, bodies merge with objects and animals to create alluring new hybrid figures. In Mimicry (1960), for example, a woman sits in a patterned chair. The shapes of her arms and hands echo those of the armrests, while the skin of her face and neck adopts the fabric’s design. Similarly, the central figure in The Creation of the Birds (1958) appears to be a genderless human-owl hybrid. A nearby machine resembles an insect, its hand depositing paint onto a palette. These types of depictions, typical throughout Varo’s oeuvre, are simultaneously ghoulish, attractive, and delicately rendered. Such dreamlike transformations became part of Varo’s unique modernist mythology. 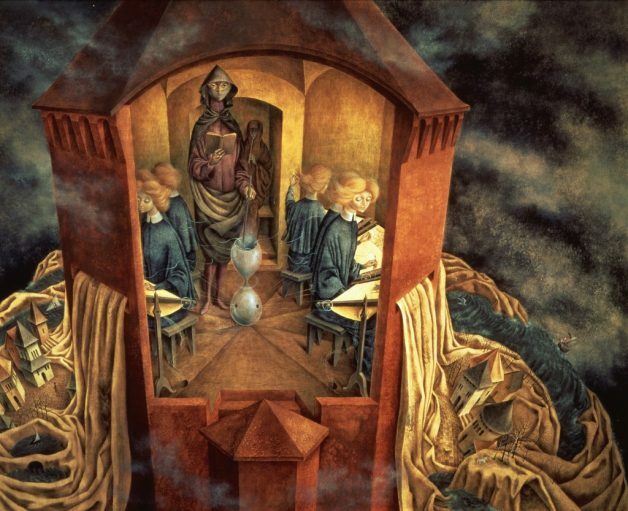 Along with the rest of the Surrealists, Varo invoked the occult to challenge viewers’ understandings of their own psychologies, bodies, and latent powers. 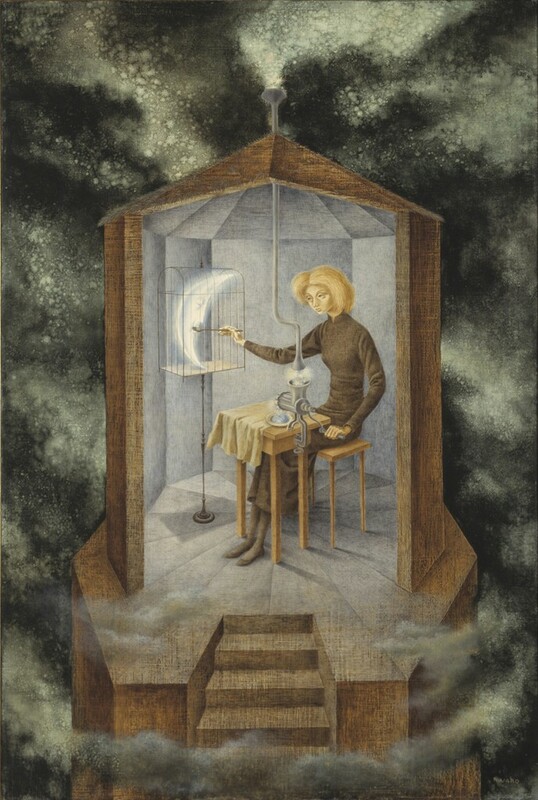 As witchcraft continues to make a comeback as an antidote to our chaotic times, Varo’s mystical paintings particularly resonate today. Though her paintings are often whimsical, O’Rawe describes their profound philosophical rigor. Varo, he says, was reading Sigmund Freud and Carl Jung; Buddhist texts; the I-Ching (a work of Chinese divination); the science fiction of Ray Bradbury; and the environmental writings of Rachel Carson. In a 2014 article, he explores how two esoteric philosophers, G. I. Gurdjieff and P. D. Ouspensky, deeply impacted Varo’s idea of the self. Remarking on the painting Rupture (1955), he writes, “A gender-ambiguous figure leaves a house from which s/he is watched by six faces that are identical to his/her own.” Scholar Teresa Arcq suggests that the faces represent false facets of personality. 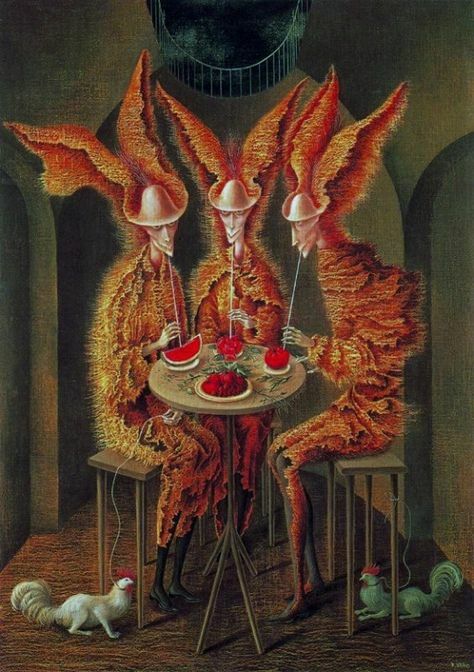 The essence of Varo’s characters, then, transcends traditional ideas about gender, and even begins to approach our contemporary conceptions of queerness.